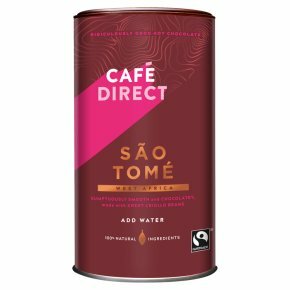 Cafédirect Sao Tome hot chocolate is a distinctive, premium quality, single origin hot chocolate. Living up to its unparalleled reputation for growing some of the most prized cocoa beans on earth, known as 'Criollo', the cocoa from this West African island produces a velvety chocolate taste and a bold, intense aroma. With only 4 ingredients and no added nastie’s it also guarantees a truly natural flavour. Fairtrade. Add water. 100% natural ingredients. Made the small way. Sumptuously smooth and chocolatey & always direct from thegrowers.Real Taste The extraordinarily sweet and delicate Criollo' cocoa used in our Hot Chocolate comes from the West African island of São Tomé, also known as 'Chocolate Island'. The island's reputation for high grade cocoa is due to a combination of rich soils and the perfect balance of temperature, humidity and forest shade. This cocoa, normally reserved for the finest chocolate, ensures a deliciously rich, smooth taste. How to make the perfect hot chocolate Add 3 to 4 heaped teaspoons to a mug of hot water. Stir well, relax and enjoy a comforting journey to Chocolate Island.